It would provide humankind with near limitless energy, ending dependence on fossil fuels for generating electricity. US Government physicists have backed plans to create ‘a star in a jar’ – replicating on Earth the way the sun and stars create energy through fusion. Physicists at the U.S. Department of Energy’s Princeton Plasma Physics Laboratory (PPPL) revealed their plan for a next generation fusion device in a paper published in the journal Nuclear Fusion. Physicists at the U.S. Department of Energy’s Princeton Plasma Physics Laboratory revealed their plan for a next generation fusion device in a paper published in the journal Nuclear Fusion. Pictured, researchers inside the centre stack of the $94-million upgrade of the National Spherical Torus Experiment-Upgrade, which began operating last year. ‘We are opening up new options for future plants,’ said lead author Jonathan Menard, program director for the recently completed National Spherical Torus Experiment-Upgrade (NSTX-U) at PPPL. The $94-million upgrade of the NSTX, financed by the U.S. Department of Energy’s Office of Science, began operating last year. Spherical tokamaks are compact devices that are shaped like cored apples, compared with the bulkier doughnut-like shape of conventional tokamaks. The plants already exists in experimental form – the compact spherical tokamaks at PPPL and Culham, England. These tokamaks, or fusion reactors, could provide the design for possible next steps in fusion energy – a Fusion Nuclear Science Facility (FNSF) that would develop reactor components and also produce electricity as a pilot plant for a commercial fusion power station. When deuterium and tritium nuclei – which can be found in hydrogen – fuse, they form a helium nucleus, a neutron and a lot of energy. Strong magnetic fields are used to keep the plasma away from the walls so that it doesn’t cool down and lost it energy potential. The increased power of the upgraded PPPL machine and the soon-to-be completed MAST Upgrade device moves them closer to commercial fusion plants, the researchers say. The NSTX-U and MAST facilities ‘will push the physics frontier, expand our knowledge of high temperature plasmas, and, if successful, lay the scientific foundation for fusion development paths based on more compact designs,’ said PPPL Director Stewart Prager. However, the devices face a number of physics challenges. How it works: Fusion involves placing hydrogen atoms under high heat and pressure until they fuse into helium atoms. For example, they must control the turbulence that arises when superhot plasma particles are subjected to powerful electromagnetic fields. They must also carefully control how the plasma particles interact with the surrounding walls to avoid possible disruptions that can halt fusion reactions if the plasma becomes too dense or impure. Researchers at PPPL, Culham, and elsewhere are looking at ways of solving these challenges for the next generation of fusion devices. The central stack of the reactor being lowered into place (left), and in situ (right). The spherical design produces high-pressure plasmas – the superhot charged gas also known as the fourth state of matter that fuels fusion reactions – with relatively low and inexpensive magnetic fields. This unique capability points the way to a possible next generation of fusion experiments to complement ITER, the international tokamak that 35 nations including the United States are building in France to demonstrate the feasibility of fusion power. ITER is a doughnut-shaped tokamak that will be largest in the world when completed within the next decade. Physicists at the U.S. Department of Energy’s Princeton Plasma Physics Laboratory revealed their plan for a next generation fusion device in a paper published in the journal Nuclear Fusion. Pictured, a test cell for the $94m National Spherical Torus Experiment-Upgrade with its tokamak in the center. The International Thermonuclear Experimental Reactor (Iter) will be the world’s largest tokamak nuclear fusion reactor when it’s complete in 2019. 35 nations including the United States are building it in France to demonstrate the feasibility of fusion power. This causes the magnetic field to be stronger in the centre than it is on the outer side. As a result, plasma contained in a tokamak can moves to the outer walls where it then collapses. In stellarators, plasma is contained by external magnetic coils which create twisted field lines around the inside of the vacuum chamber, according to Science. As such, it overcomes can continuously hold the plasma away from the walls of the device. Its key component is a ring 50 superconducting magnetic coils approximately 3.5 metres in height. In total the device is 16-meters-wide. The stellarator design was first thought up in 1951 by Lyman Spitzer working at Princeton University. But at the time, it was thought to be too complex for the constraints of materials available in the middle of the 20th Century. Now using supercomputers and new materials, researchers have finally made Spitzer’s vision a reality. ‘We all know the trend of global development, the hunger for energy of emerging economies and emerging countries,’ said Professor Johanna Wanka, Federal Minister for Education and Research. ‘So when we talk about energy, we need research that keeps all options open. And one of these options is nuclear fusion. The machine took 1.1 million hours to assemble, using what has been described as one of the world’s most complex engineering models. Testing of the magnetic field in the Wendelstein 7-X fusion device was completed in June – much sooner than expected. 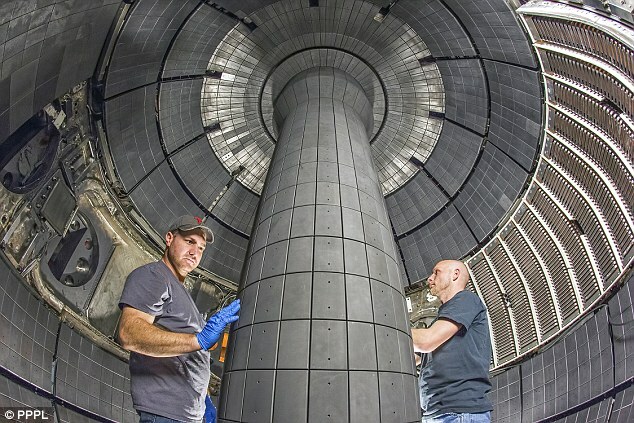 The test revealed that the magnetic cage for the fusion plasma, which has a temperature of many million degrees, was working as scientists predicted. If the machine works for longer periods of time, scientists believe it could herald a change in the direction for fusion power.